Partnerships are when 2 or more persons own and manage a business together for profit. There are many advantages of working in a partnership. For one, it utilizes the talents and skills of more than one person, giving a synergistic effect on the business. For instance, one partner may be good at making products for sale; another may be good at marketing it; yet another may be good at administrating the business. Partners are able to pool their financial resources (one person won’t have that much capital). While the rewards of the business will need to be shared between partners, the risks are shared as well. This type of business entity is also easier and less expensive to form compared to corporations, as well as being less formal and more flexible (as less members are involved in decision-making). Partnerships are not limited in terms of legal liability. In other words, if a partner does something (legally) wrong, ALL partners are considered to be at fault, and there is no limit as to the damages to be paid. In other words, if the business does not have enough funds invested in it to repay the damages, the partners will need to source for funds in their personal capacities. Also, any contract made by a partner is binding on all other partners. Note: Contrast this with corporations with limited liability – a corporation will only ever need to pay damages to the extent of the funds invested in it, and no more. Having said this, limited partnerships do exist. These are unique legal forms that provide partners who are not involved in the operations of the business with limited liability. However, there must be at least one general partner who operates the business, and the remaining partners will be considered limited partners. As a business entity, a partnership is not taxed. However, if the business concern shows a profit, the shared profit will be counted towards the income of the individual partners, which is THEN taxed. 1. Partners may contribute different amounts of capital into the business, and withdraw funds from their capital accounts. Hence, separate capital accounts are maintained, in a statement of partnership equity. 2. Partners may share profits in different ratios, according to the partnership agreement. Hence, the profit must be properly apportioned, in a profit and loss appropriation account. Statement of Partnership Equity The changes in the partners’ capital accounts for a period of time are reported in a statement of partnership equity. 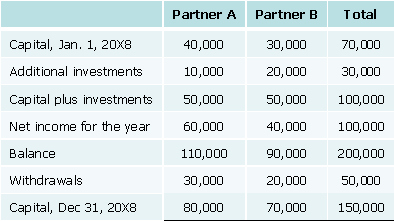 There is a capital account for each partner. Capital may be contributed by partners in the form of assets, or cash – the capital accounts will be credited by the value of the assets/cash contributed. The capital accounts starts with capital balances at the beginning of the accounting period, and reflects additional investments made by the partners during the year, as well as net income for the period, and withdrawals. Additional investments and allocated net income increase capital accounts of the partners. All kind of allowances, like salary allowances and capital allowances, are treated as withdrawals, which reduce capital accounts. 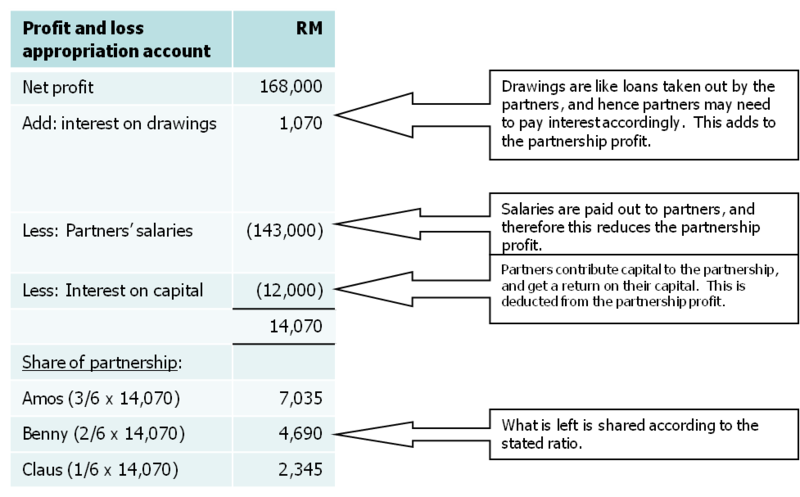 The end result is capital balances of the partners at the end of the accounting period. Sometimes, capital accounts are separated into fixed and current accounts. Fixed capital accounts will record only the original capital amounts contributed, the balances of which will remain unchanged. Sharing of profits or losses. Profits/losses can be shared on any agreed basis (stated in the partnership agreement), but they are usually based on fixed capital contributions. The sharing of the profits or losses are detailed in the profit and loss appropriation account. An example of one will be showed further down on this page. Drawings. These are withdrawals by partners from the business. Interest on drawings may be charged by the business, on the partners making the withdrawals. Interest on capital. These represent payments to the partners on their capital contribution. The partner who contributes more capital will get a larger interest. Partners’ salaries. These are usually paid to partners who contribute time in the management of the business. Sleeping partners are those who do not actively manage the business. 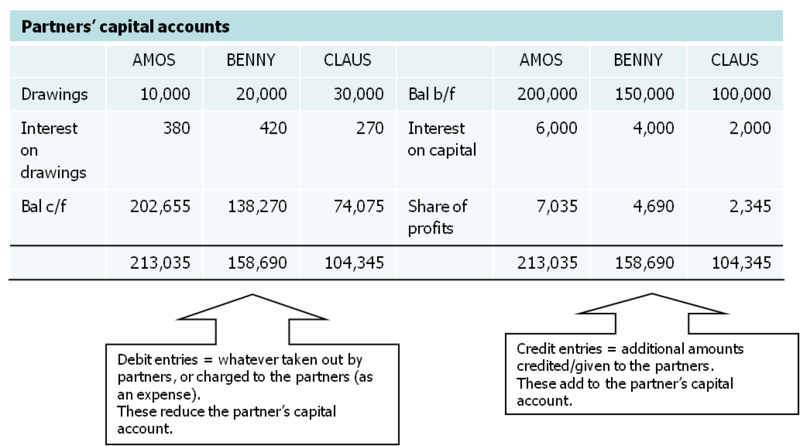 WORKING EXAMPLE 1 Amos, Benny & Claus are partners, sharing profits & losses in the following proportions: 3:2:1. By agreement, partners are to be credited with interest on capital & charged with interest on drawings. Net profit for the year is RM168,000. 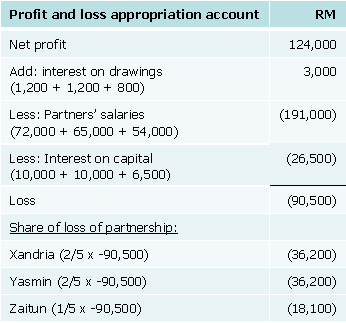 First, we prepare the Profit & Loss Appropriation Account, which is really an extension of the normal income statement, and shows how the net profit/loss is shared by partners. 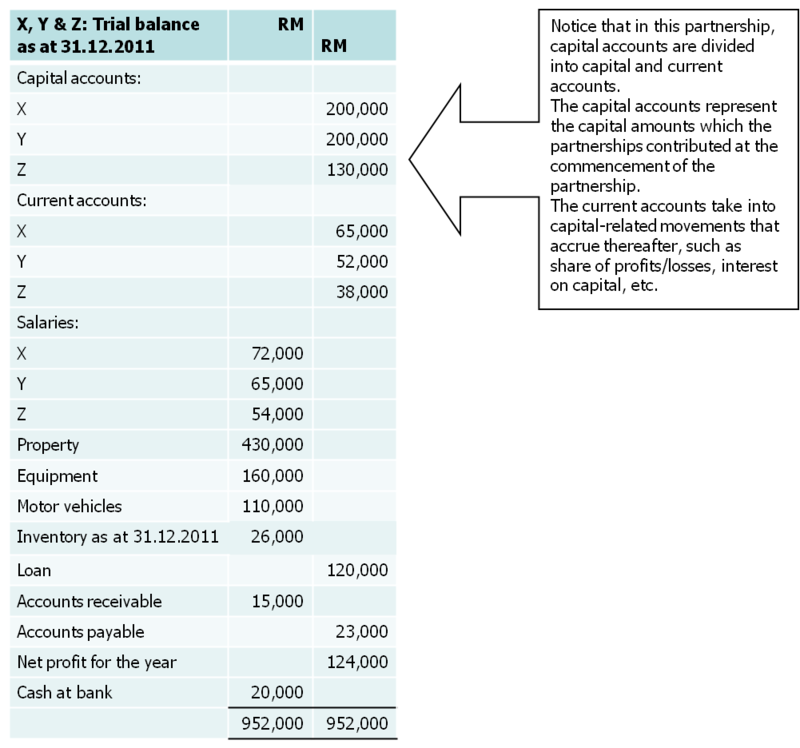 WORKING EXAMPLE 2 Xandria (X), Yasmin (Y) and Zaitun (Z) had the following trial balance extracted from the books of their business on 31.12.2011. The balances are stated BEFORE considering interest on capital and interest on drawings. X, Y & Z share profits and losses in the ratio 2:2:1 respectively. 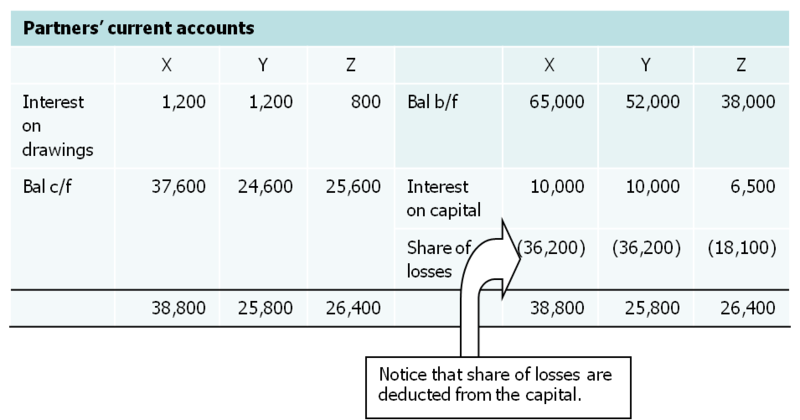 Interest on capital will be equal to 5% of the balances in the capital accounts. Interest on drawings were determined as RM1,200 for Xandria, RM1,200 for Yasmin and RM800 for Zaitun. Return to Accounting Adventurista Home from Partnerships.